In the past 7 days the area near Papua New Guinea has had 56 earthquakes larger than 4.3. This included a magnitude 7.1 and a magnitude 7.5. This area experiences large earthquakes quite frequently. In the past 5 years there have been 40 events larger than magnitude 6 and 2651 events greater than magnitude 4.
l downloaded csv files from the USGS and made a couple histograms and a plot of time vs depth for the past 7 days. These plots can be seen here. This entry was posted in Uncategorized on May 8, 2015 by Kyle A Homman. Deterministic vs. undeterministic earthquake magnitude based on it’s rupture!! The dominant rupture process theory implies that we can’t determine the earthquake magnitude from it’s rupture initiation. However, the new findings with the following paper suggest that we could determine the earthquake magnitude by studying the frequency content for the first few seconds of the rupture. This entry was posted in Uncategorized on May 7, 2015 by Thamer. Larent Bollinger and his colleagues anticipated a major earthquake to happen in the exact location that last Saturday’s event occurred. Bollinger’s team dug trenches across the main earthquake fault where the fault met the surface and “used fragments of charcoal buried within the fault to carbon-date when the fault had last moved.” They discovered that this segment of the fault had not erupted for a very long time, 1344 to be exact. They also discovered that the 1344 event was preceded by large event on a neighboring fault in 1255. They theorized that the movement from 1255 event caused strain to be transferred westward along the fault, which was finally released in 1344 (89 years later). In 1934, a large earthquake, taking over 17,000 lives, ruptured the segment of the fault where the 1255 took place. The Nepal event that just recently happened, some 81 years later, seems to follow this historic pattern. Another article that goes more in depth with regards to the historical seismicity of Nepal. This entry was posted in Uncategorized on May 7, 2015 by Ashley Nichole Grijalva. Our beliefs are changing through time, because some of them had been chosen based on our world view and what can fit with our previous background rather than what can represent nature itself. However, one of those beliefs is about earth’s inner core structure and iron crystals orenintation. Geoscientists used to represent the inner core as a cylindrical symmetry that aligned towards the poles (north-south). In fact, they had no evidence for that except that it fit their general model for the earth interior. Recently, a group of scientists studied carefullay the seismic waves that penetrate the inner core and tried to discover the iron crystal orientation. The results were astonished when they found two orientations within the inner core. The inner part of the inner core shows iron crystal alinement toward the equator while the outer part of the inner core is almost perpendicular in which it shows north-south alinement. What can such finding tell us about Earth? In fact, that would improves our understanding about how our planet from in one hand, and give an important insight about inner core dynamics in the other hand. As science is defined by philosphers as the procces of discovering patterns, however, sometimes those patterns break down revealing new exception! In fact, with time those exceptions form a new pattern. In lithospheric dynamics, is well known that earthquakes occure in the brittle part of the crust, while creep occurs in ductile part of crust. That is not the case in Hollister in California where creep can be found on the surface!! However, geoscientists have different explinations for such phenomena. Check the following link which is a report made by USGS summerized most of the geophysical findings in Calaveas fault creep in Hollister. 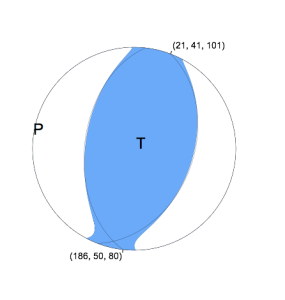 This entry was posted in Faulting, Seismic Source Theory, Seismicity on May 6, 2015 by Thamer. The banks of the Stillaguamish River near Oso, Washington have been known to landslide. In the last 50 years, 6 events were documented. On March 22nd, 2014 a catastrophic landslide occurred ~ 6.5 km from Oso causing 43 fatalities. The landslide traveled approximately 1.1 km covering a nearby highway, destroying several homes, and damming the Stillaguamish River. To investigate the slope failures a team of scientists analyzed short and long period signals from the landslide. They found that the landslide was comprised of a series of multiple failures with two major collapses that occurred ~ 3min apart. The first event showed characteristic features of seismic signals generated by landslides, notably an emergent onset and lack of clear p and s waves. The second event was more impulsive with several discernible amplitude peaks. 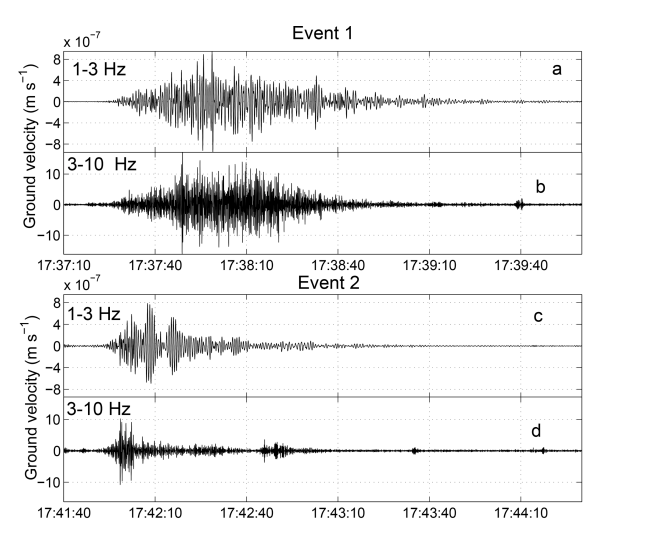 Shown above are the seismic signals from the 2 events filtered between 1-3 Hz and 3-10 Hz for (a&c) and (b&d), respectively. Figure from: Hilbert et al., 2014 (The entire report can also be found at that link. The long period signals were used to invert for the forces acting at the source. Combined with remote sensing data they were able to estimate the volume of material displaced by the landslide. The first event displaced between 6.0e6 and 7.5e6 cubic meters of material. In total a volume of 7e6 and 10e6 cubic meters was mobilized during the landslide. This entry was posted in Earthquake Hazards, Seismicity on May 6, 2015 by Kerry Lynn Ryan. Just an upadte for landslides triggered by the Nepal Earthquake. The key point is to evaluate the landslides and the potential mass wasting during the coming monsoon. This entry was posted in Uncategorized on May 6, 2015 by Andres Gorki Ruiz Paspuel. A brief illustration of filters is here. This entry was posted in Exploring Seismic Data, Seismic Data Processing on May 5, 2015 by Kyle A Homman. Insight, standing for Interior Exploration using Seismic Investigations, Geodesy and Heat Transport, is a NASA funded mission to place a single geophysical robotic lander on Mars. The lander is planned for launch on March 2016 and will be equiped with a seismometer and a heat flow probe. The main objective of this mission will be to study Mars’ deep interior and early geological evolution bringing a better understanding of the Solar System’s terrestrial planets and their evolutionary process. The seismometer will help determine whether there is any seismic activity in Mars as well as the size, thickness, density, velocity and overall structure of Mars’ crust, mantle and core. The seismometer is a broad-band instrument and is designed to detect sources such as quakes but also seismic ambient noise generated by atmospheric excitation and tidal forces from Mars’ satellite. However if any seismic activity is recorded, its source won’t be located because at least three seismometers are needed to locate the source of a quake. So besides the obvious answer of cost, I was wondering why they don’t plan on sending more seismometers. Would anyone have an idea ? This entry was posted in Acquiring Seismic Data, Exploring Seismic Data, Seismicity on May 5, 2015 by Maeva Pourpoint. What’s all this talk about (interplate) Earthquakes? The Virginia Earthquake (M5.8) occurred at roughly 2 pm on August 23, 2011 in the Virginia Seismic Zone (central Virginia). In Mineralogy lab on the fifth floor at Virginia Tech, my microscope nearly toppled over. After the shaking ceased, students rushed down the stairs to check out the live stream from nearby seismographs. Needless to say, this earthquake struck close to home. 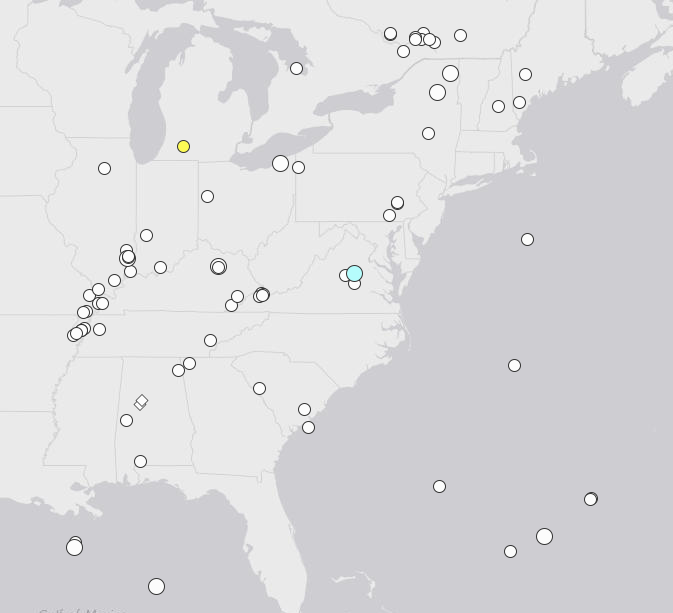 A surprise to many, the Virginia Earthquake was an unexpected, relatively large East Coast intraplate event. Unlike most of the events that occur in the North America (Californa, Alaska, etc.) this event happened far from any active tectonic boundary. Events like this remind us that the stresses and strains we use to describe such boundaries, are actually present all over. and includes different values for alpha. For interplate earthquakes, values of alpha are usually around 1×10-5 whereas for intraplate events values for alpha fall closer to 6×10-5. So while both sets of earthquakes “obey the same scaling laws, intraplate earthquakes have, on average, 6 times more slip on the fault.” This further indicates that stress drop is much larger for intraplate earthquakes. These differences are likely a direct result of differences in frictional properties between the two types of earthquakes. Those occurring away from plate boundaries have more slip on shorter lengths with slower slip velocities. Another interesting aspect of East Coast intraplate earthquakes is the distance from which they are able to be felt. 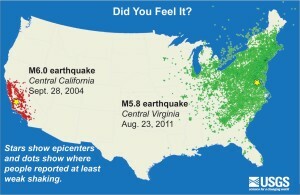 For similar magnitude events in California, shaking is usually felt within the region, like most middle magnitude earthquakes in the East Coast, the Virginia Earthquakes was felt at much larger distances. This is a result of crustal difference between the eastern United States and the West Coast. The older, denser crust in the East allows seismic energy to propagate much further. This entry was posted in Uncategorized on May 4, 2015 by Austin Laurent White-gaynor. Ashley Nichole Grijalva on What’s all this talk about (interplate) Earthquakes?